The Obama administration on Thursday released an email sent by Edward Snowden to the NSA’s general counsel last year – an important document in the debate over whether the leaker of classified government documents attempted to raise questions “through channels” about the agency’s domestic surveillance programs. The email is the lone document found so far, according to U.S. officials, that could be seen as offering support for Snowden’s claim that he attempted to alert officials at the NSA to what he considered improper or illegal domestic surveillance by the agency before he began leaking the secret documents. The document is a request for clarification about a legal point in training materials for a mandatory course regarding policies and procedures restricting domestic surveillance by the NSA. 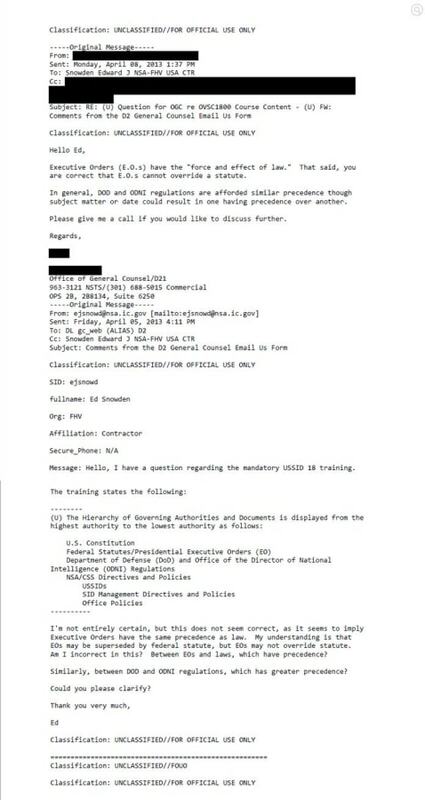 The lack of context surrounding the email leaves room for interpretation on Snowden’s motives for making the inquiry. 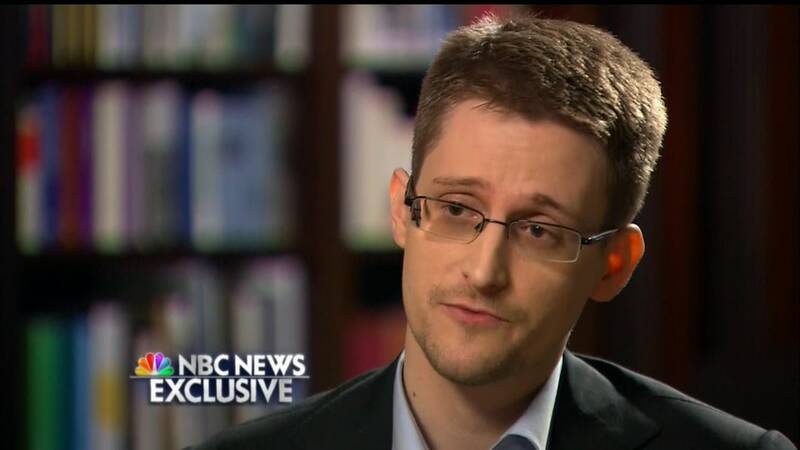 In an exclusive interview with NBC Nightly News anchor Brian Williams last week in Moscow that was broadcast Wednesday night, Snowden said he had warned the NSA, while working as an contractor, that he felt the agency was overstepping its bounds. But Sen. Dianne Feinstein, D-Calif., and chair of the Senate Intelligence Committee, issued a statement on Thursday saying that the email does not support Snowden’s account. “The email, provided to the committee by the NSA on April 10, 2014, poses a question about the relative authority of laws and executive orders — it does not register concerns about NSA’s intelligence activities, as was suggested by Snowden in an NBC interview this week,” she said. Snowden sent the email released Thursday to the NSA’s lawyers on April 5, 2013, while he was on temporary assignment at NSA headquarters in Ft. Meade, Md. The email was sent a month after Snowden had taken a job that provided him with greater access to classified access and a month before he began leaking documents to reporters. The email, bearing the subject line “Question for OGC re. OVSC1800 Course Content,” focuses on whether executive orders issued by the president can trump a federal statute. 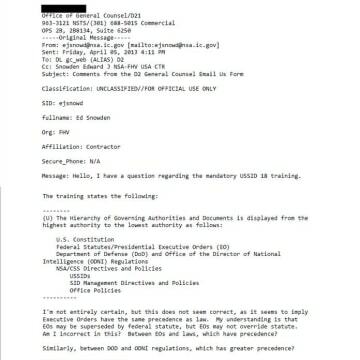 The email went on to ask whether Department of Defense regulations or those of the Office of the Director of National Intelligence would take precedence. The email from Snowden indicates that his question arises from materials from a mandatory training on USSID 18 – Signals Intelligence Directive 18 – a law that essentially prohibits the NSA and other intelligence agencies from domestic spying on Americans without a warrant. In that regard, it offers limited support for Snowden’s contention that he raised questions about the program to higher-ups at the NSA. 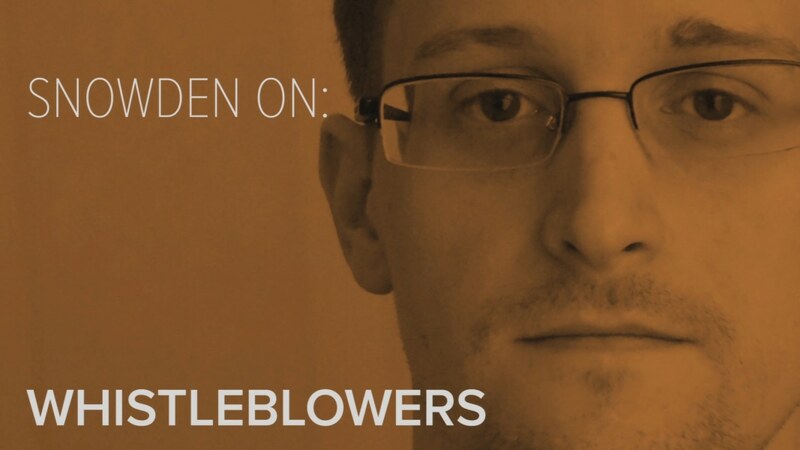 The People Have Tweeted: Is Snowden a #Traitor or a #Patriot? But it also supports the account of two U.S. officials who spoke to NBC News about the email prior to its release. They noted that it asked a question about how the NSA was interpreting its legal justifications for domestic surveillance, but had not “raised concerns” about the NSA’s practices, as he claimed. Follow NBC News Investigations on Twitter and Facebook.